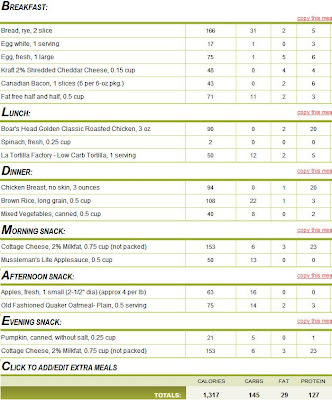 It's amazing how difficult it was for me to plan for (and accept) less proetin and more carbs. In fact, it's kinda scary... but I'm going to give this a solid shot for myself (and for Jeremy, since he gave me his time). I decided to use SparkPeople for tracking again because I can easily manipulate my goals for easier tracking. The one limitation with the Apex/BodyBugg site is that if your macronutrient breakdown doesn't fall within their guidelines, you can't use it. Phooey on them! I just won't. My cardio is going to be something new. On the stationary bike... which I'm not a fan of. But J says try it... so I will. I'll be going full out for 30 to 60 seconds, then slowing down for a couple minutes, then repeast (Intervals). I'll do it 10 times... eventually 15 times. My weight lifting days will be high intensity, in that I will do heavier weight but just for 3 sets of 6 to 8 reps.